American Physician Partners is a provider of turnkey outsourced emergency department management services to medical-surgical hospitals nationwide. APP’s outsourced solution entails managing all clinical and operational aspects of the ED for its customers on a 24×7 basis including the recruiting, staffing, and scheduling of clinical specialists and working closely with hospital personnel on the care coordination and treatment planning for each patient beyond the ED. 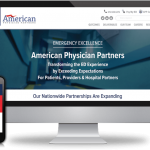 Nashville Geek partnered with the American Physician Partners marketing & design team to develop a new, custom mobile responsive WordPress website that integrates a REST API for recruiting. Utilizing the REST API allows the APP recruiting team to easily manage career postings in one location for updates to the website and a variety of career networks. To learn more about REST API integration and WordPress, visit our blog.